Why not get on the gin trail this summer? It’s still a surprise to some that Barcelona is so ingrained into the development of the gintonic, but today the city is widely regarded as a focal point for gin lovers. Gin Route Barcelona was started in 2017 by Mike Braff, before returning to his beloved UK before the end of the year. This past February, Bennetta Fairfax took over the reigns and the rest is history. Gin Route is Spain’s first gin tour based in Barcelona, although further exciting events are expected to be added throughout the year. The guided tour, set in Barcelona’s barrios (neighborhoods), lasts just under three hours, taking in a few stops at unusual clandestine, speakeasy-style bars. Enjoy gin and tonics from small-batch distilleries at each bar, before your trip concludes at a trendy cocktail bar or restaurant, where a special menu is available to guests. Tours can be tailored to suit the party. Other packages available include gin masterclasses at €50 to Artisan Gin Teas €35. As Scotland’s reputation for craft gins continues to swell, this tour in Edinburgh is one not to miss. The website asks the question, ‘Why not spend two hours in the afternoon swilling gin and tasting food flavoured and inspired by gin and a gentle gin-tinted walk through Edinburgh’s glorious New Town streets?’ It’s a good question and I’m still waiting to hear valid answers. Organiser Nell Nelson is passionate about Edinburgh and its food and drink. She started Edinburgh Food Safari in April 2015, with its gin offering a recent, and very welcome, addition. The two-hour tour starts with Edinburgh Gin and a sample of one of its signature gin liqueurs – the choice is yours, served with cava. If you can tear yourself away, the tour moves to The Marshmallow Lady where you’ll enjoy a made-on-the-premises toasted gin and tonic marshamallow, blended with Mackies of Scotland ice cream and milk, topped with more toasted gin and tonic marshmallows. Then on to local fishmonger Armstrongs of Stockbridge for a Pickering’s gin-cured smoked salmon a gin and tonic chocolate, and finally a cocktail at one of Edinburgh’s coolest gin joints for a Caorunn Gin & Tonic. £39 per person and run most Fridays – how charming. Iconic car and a drink or two in what many consider to be the home of gin? That sounds like a winning ticket to me. A two-three hour round trip in a beautifully restored Classic Mini Cooper that will take you around Central London’s best gin bars and distilleries with designated driver all part of the package. Thankfully, the driver won’t be drinking, but is a highly trained local guide and more than willing to show you some of London’s hidden gems. The experience will take you to three of the best gin bars in London and a distillery. One of the bars on the tour proudly stocks over 500 gins and 30 tonics, so the potential G&T combinations are vast. As you can fit three passengers into a mini, along with your guide/driver, it’s a great opportunity to gather some gin-loving friends for a day out. You’ll be dropped off back in Zone 1, ready to continue with your sight-seeing, shopping or stagger home. If by land is not quite your thing, why not go by boat? Setting sail on a three-hour cruise from Poole every Friday afternoon and hosted by Dorset Cruises – you can come aboard a vintage motor yacht and sample a range of gins and canapés. Two ticket types are available. For VIP tickets, each table of six will have a 70cl bottle of gin and 12 Doubt Dutch mixers waiting for you. The guest distiller will introduce their gin and provide a mini-masterclass on their back-story and botanicals. Onboard is a mixologist who will prepare three gin cocktails of choice for each VIP. Single ticket holders are given three gin tokens each, which can be taken to the bar as you enjoy the fun and soak up the atmosphere on the upper, fore and stern decks. Tokens are exchanged for a G&T serve as you cruise past views of Brownsea Castle, Millionaires Row at Sandbanks and the islands of Poole Harbour. 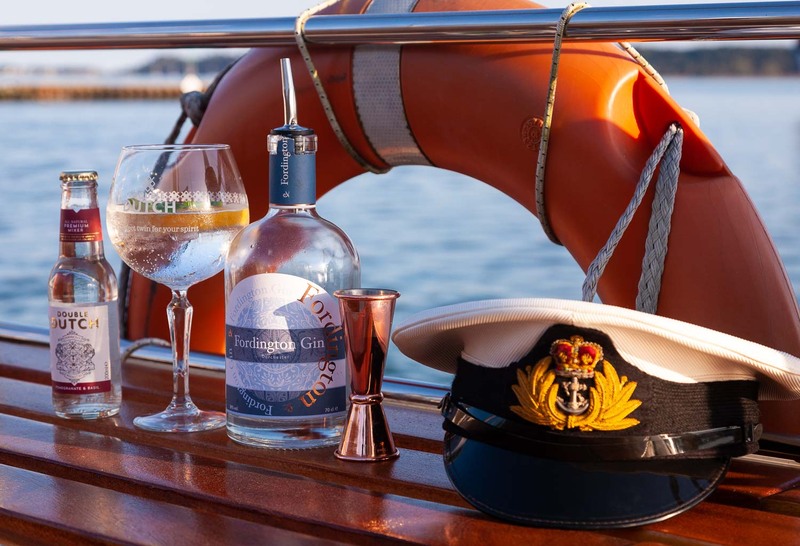 Dorset Cruises hosts the county’s first gin distillery, Conker Spirit, onboard its Dorset Queen. Available to just 24 guests, the trip includes a masterclass from one of Conker Spirits’ Conkerers, who will teach you about gin production, the rise of the distillery and how it landed on its 10 botanical recipe. Guests receive two Conker Gin cocktails made by the onboard mixologist, before mooring alongside the private quay, pier or pontoon at a harbourside restaurant for a three-course meal, before setting sea with a further cocktail using one of the Conker Cold Brew range. As a memento you’ll leave with your very own 70cl bottle of Conker Spirit, hand-signed by your onboard Conker host. Tours are available once a month in June, July and August.